It may sound like the beginning of a joke, but a fatty liver is nothing to laugh about. Research continues to reveal the connection between a fatty liver and many other health conditions, including cancer. Fatty livers also tend to be largely symptom-less until serious complications arise, making it important to take preventative steps early. This is one fat joke you’ll want to take seriously. NAFLD is somewhat common among adults in the U.S. It affects 30-40% of the population to some degree. There are several factors that can increase a person’s risk for NAFLD, and most of these have to do with being overweight such as high cholesterol, type 2 diabetes, underactive thyroid, and high triglyceride levels. Other factors include sleep apnea, metabolic syndrome, and polycystic ovary syndrome. The type of people at greatest risk for developing NAFLD are older people age 55 and over, people who already have diabetes—type 1 or 2—, and people with body fat concentrated in the abdomen. Poor diet and rapid weight loss have also been associated with NAFLD. While these factors do make a person more likely to get NAFLD, anyone can get it whether they have these risk factors or not. NASH or non-alcoholic steatohepatitis is when the fat in the liver from NAFLD causes liver damage, fibrosis, or cirrhosis. This is much more serious and can lead to complications like malnutrition, vein rupture, and liver failure. If you have NAFLD plus one or more of the risk factors listed above, you are much more likely to develop NASH. A difficult piece of NAFLD is that it often has no symptoms. Occasionally people may experience fatigue, loss of appetite, abdominal pain, enlarged blood vessels, fluid buildup, or swelling in the legs or stomach. A frequent sign that something is wrong with the liver is a condition called jaundice, which causes yellowing of the skin and eyes. However, these symptoms can be associated with several illnesses, so it is hard to isolate them to the liver if they do occur. One way your doctor may suspect NAFLD is if your liver enzymes are elevated. This can be seen in a routine blood screening that tests for basic things like cholesterol, triglycerides, and various other standard blood tests. Physical changes like an enlarged liver or jaundice can often be observed during routine physical exams. 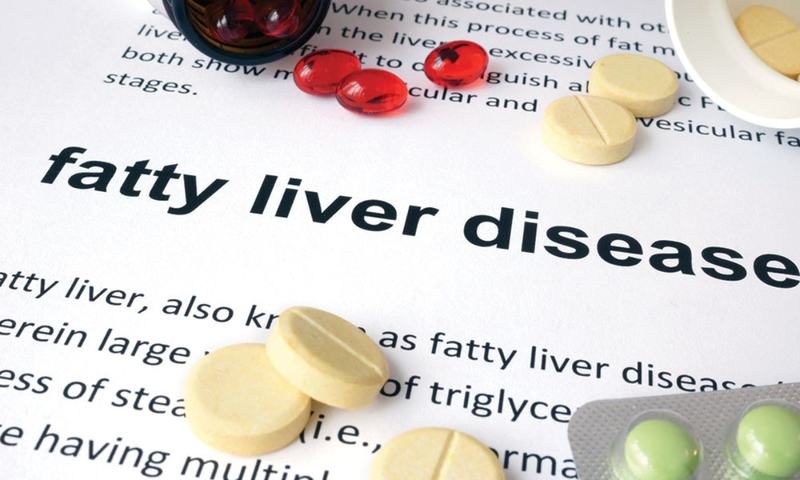 If a fatty liver is suspected, your doctor may run further blood tests to rule out other liver conditions. She will also likely recommend imaging tests like ultrasound, CT scan, and/or MRI to see if there is fat in the liver. If none of these are conclusive, it may be helpful to obtain a liver biopsy where tissue from the liver is taken out for analysis. Many people live with simple NAFLD without additional complications because there is no subsequent cell damage or inflammation. However, NASH does put you at a much higher risk for cancer—even more so than obesity. In a study presented at The Liver Meeting held by the American Association for the Study of Liver Diseases, results showed that people with obesity and NAFLD were much more likely to get cancer than obese people without NAFLD. The study revealed that NAFLD proved to be the key to increased instances of pancreatic, stomach, colon, and liver cancers. Interestingly though, every type of cancer tested except lung and esophageal were more common in patients with NAFLD than patients without. If you are curious about your own liver health and how it may be affecting your risk for gastrointestinal cancers, we can help! Cary Gastroenterology can perform physical examination and any testing necessary to assess your overall health. You can request an appointment online at one of our many locations.